I haven't seen a whole lot of posts around the blogosphere for 2011 Topps Tier One so I figured I'd share the four cards I've picked up. 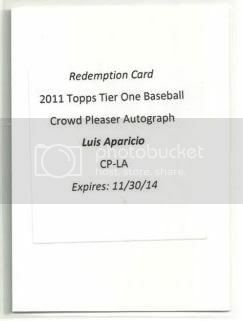 Yah I know redemption cards aren't very exciting but I'm hoping that this one's really cool once Topps gets around to sending it to me. I've heard that they're numbered to 99 but who really knows.